News » Exportise is an export sales consultancy providing skills and services needed for Irish enterprises to generate new export business in Europe and worldwide. Enterprise Ireland have reacted quickly to the Brexit decision by providing important information for exporters in light of the UK decision, as well as launching five pillars of support for Irish companies exporting to the UK, including information and guidance, market diversification supports, international sector clustering strategy, UK in-market supports and competitiveness and market development supports. 2016 has been busy so far for Exportise, in particular for our senior project manager Sebastian Perry. Sebastian has spent a lot of time on the road, attending international trade shows and business meetings with and for our clients in Germany, Switzerland, Czech Republic and Scandinavia. Our clients have benefited immensely from these events, securing new business contracts as well as nurturing existing ones. We at Exportise cannot stress strongly enough the advantages of engaging face-to-face with prospective clients: we believe international trade shows are an important element in any export sales plan. We’ve even written a guide on how to do it well: have a read here to help you get the most from your upcoming tradeshows: Mastering Tradeshows to Maximise Export Opportunities. Bon voyage! Exportise has just completed its first Sales Pipeline Management workshop of the year, which is part of the Enterprise Ireland Excel at Export Selling programme. This highly practical one-day workshop assists companies to implement a structured and systematic sales pipeline management system in order to increase their conversion of sales leads and grow their export sales more quickly. The companies that attended ranged from small start-ups with limited export sales to large multi-million turnover companies with vast export experience. Attenders were from a range of sectors, including technology, chemical, food, environmental and design sectors, and through this workshop, they have gained vital tools, templates, best practices – and hopefully the enthusiasm required! – to take their export sales to the next level. If you have about any aspect of export selling – sales pipeline management, export sales processes, nurturing opportunities and sales audit structures – get in contact with us as we would be delighted help or guide you in the right direction. Exportise were present this morning at the launch of the Irish Exporters Digital Marketing Research & Insights publication, carried out by Voodoo on behalf of the Irish Exporters Association. A panel of involved professionals shared a lot of revealing and interesting insights and statistics regarding the digital behaviour of Irish exporting companies. Hosted by William Fry at the Grand Canal Dock offices, we at Exportise were suitably enthused by the informative presentations and the opportunity to chat with our fellow exporters. And we could certainly recommend that you check out today’s presentation by Jamie Dowling, the managing director of VooDoo, which is available online here. Exportise is growing yet again and currently hiring an Inside Sales Specialist. You will be part of a dynamic inside sales team based in Dublin. You will join at an exciting time as part of a growing team in a young, energetic company that is currently experiencing rapid growth with a unique product offering. Click here for the full job description: Inside Sales Specialist. It’s been a busy couple of months for Exportise. We’ve secured two multi-million € contracts in mainland Europe on behalf of one of our long-standing clients. We’ve set up excellent meetings for our key clients, many at industry trade shows in Europe, with companies from China, India, Canada, USA, Sweden, UK and Australia with some of them progressing into new export business opportunities. We have also just completed a project in Sales Process & Sales Management consultancy with the Cork based company Post Formed Systems, who specialise in the design and manufacture of bespoke cubicle washroom environment. The company now has a simple yet powerful system to manage business opportunities which, in time, will improve their hit rate and reduce the number of lost opportunities when selling into export markets in the UK and Europe. Upcoming projects for the second half of the year include UK market development for an Irish health and personal hygiene company, as well as continuing our work with longstanding clients in the electronic, life sciences, and construction sectors. Is relying on English good enough? Multilingual communication as a tool for export growth… By Giovanni Giusti via Irish Exporters Association. ‘If exports are an important part of your growth plan, you need to be able to communicate with your customers in their language. 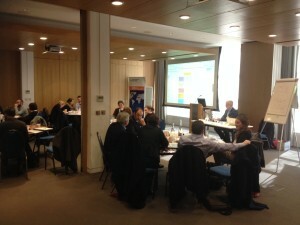 Today the Irish Exporters Association together with ABP Ireland, AIB, DHL Express, Euler Hermes and PwC are launching the National Export Campaign and National Export Hub in collaboration with the Department of Foreign Affairs and Trade and Enterprise Ireland http://www.irishexporters.ie/about-iea-hub/. Exportise are at hand to offer export consultancy advice to the SMEs. Exportise have recently started a new consulting process with one of Enterprise Ireland’s client companies as part of their Strategic Marketing Review Programme – click here for the Programme details. We’re delighted to be applying our marketing and export consulting skills in yet another programme supporting Irish SMEs. The Irish Exporters Association have put together a comprehensive submission to Government in advance of Budget 2015 next week (October 15).